Without original boxes and booklets. The pictures you see show the actual pen on sale. 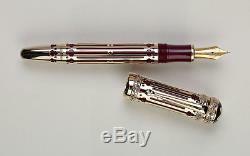 The pen has never been polished and the patina you may see on its golden or silver parts is due to its unpolished condition. The Pen Lover Boutique - VAT number: 03884760160 St. Brusaporto 22D - Seriate (BG) - Italy +39.333.69.75.053. The item "BRAND NEW MONTBLANC FP CATHERINE THE GREAT 4810 PATRON OF ART (ASK FOR DISCOUNT)" is in sale since Tuesday, May 16, 2017. This item is in the category "Collezionismo\Penne\Stilografiche". The seller is "thepenlover" and is located in Marsascala.